Allergies, obesity, acne: these are just a few of the conditions that may be caused—and someday cured—by the microscopic life inside us. How does this groundbreaking science influence your health, mood and more? Pioneering scientist Rob Knight pairs with award-winning science journalist Brendan Buhler to explain why these new findings matter to everyone. In just the last few years, scientists have shown how the microscopic life within our bodies—particularly within our intestines—has an astonishing impact on our lives. Your health, mood, sleep patterns, eating preferences – even your likelihood of getting bitten by mosquitoes – can be traced in part to the tiny creatures that live on and inside of us. 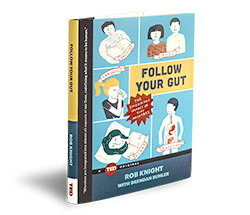 In Follow Your Gut, pioneering scientist Rob Knight pairs with award-winning science journalist Brendan Buhler to explain — with good humor and easy-to-grasp examples — why these new findings matter to everyone. They lead a detailed tour of the previously unseen world inside our bodies, calling out the diseases and conditions believed to be most directly impacted by them. With a practical eye toward deeper knowledge and better decisions, they also explore the known effects of antibiotics, probiotics, diet choice and even birth method on our children’s lifelong health. Ultimately, this pioneering book explains how to learn about your own microbiome and take steps toward understanding and improving your health, using the latest research as a guide. How many microbes are in your body? You are made up of about 10 trillion human cells — but there are about 100 trillion microbial cells in and on your body. Which means: you are mostly not you. We're discovering that microbes are deeply integrated into almost all aspects of our lives. Indeed, microbes are redefining what it means to be human. 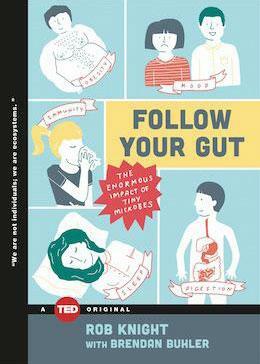 "The enormous implications of this micro-scale relationship, implicated in conditions as diverse as obesity, anxiety, arthritis, autism, and depression, are what Rob Knight explores in the deeply fascinating Follow Your Gut." "Everything you wanted to know about microbes is told in Follow Your Gut: The Enormous Impact of Tiny Microbes, in which pioneering scientist Rob Knight teams up with award-winning science journalist Brendan Buhler to explain why the microscopic life within our bodies—particularly in our intestines, the largest and most important microbial community—is redefining what it means to be human and how improving our understanding of the unseen world inside ourselves will help readers make better decisions regarding their health in the present and in the future." As seen in Financial Times: "The inside story of the microbiome"
Rob Knight is a Professor of Pediatrics and Computer Science & Engineering and Director of the Microbiome Initiative at the University of California, San Diego. He is co-founder of the American Gut Project and the Earth Microbiome Project. Brendan Buhler is an award-winning science writer whose work has appeared in the Los Angeles Times, California and Sierra Magazine. His story on Rob Knight’s work was selected for the 2012 edition of The Best American Science and Nature Writing.